Is innovation severely lacking in online education? most responding institutions have online program tuition rates that are aligned with standard tuition or that are higher. Those higher tuition rates ranged from 12 percent of private institutions to 29 percent of four-year public institutions, and lower than standard tuition rates ranged from 3 percent of community colleges to 37 percent of private institutions. None of the larger online programs reported tuition rates for online students that are lower than standard tuition rates, and 20 percent reported higher tuition rates for online study. Forty percent of chief online officers in larger programs larger programs use instructional design support, and 30 percent use a team approach to online course design. Ten percent outsource course design. This kind of course development is in stark contrast to practices of chief online officers in mid-sized and smaller programs. Among the smallest online education programs, 18 percent of chief online officers expect faculty to develop online courses independently, and 53 percent treat instructional design support as a faculty option. This means that a combined 71 percent of smaller programs do not mandate the use of instructional design specialists. In 13 percent of mid-sized programs, faculty are expected to develop courses independently, and in 64 percent of mid-sized programs, they are free to choose whether or not to involve instructional design specialists, yielding a combined 77 percent of programs that do not require the use of instructional design expertise. Whether you’re flipping your courses, creating videos to help your students understand specific concepts or recording lectures for exam review, these tips can help you optimize your production setup on a tight budget. Record your video and upload it to YouTube. YouTube will apply its machine transcription to the audio as a starting point. Then you can download the captions into your caption editor and improve on the captions from there. 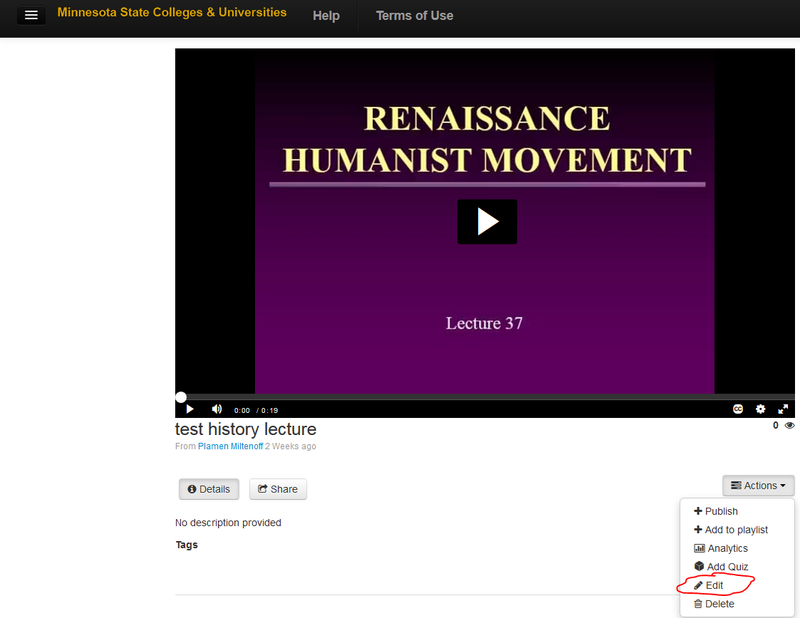 Afterward, you can delete the video from YouTube and add it to your institution’s platform. Do you use lecture capture in your courses? If you do, please join us in one-hour information session. Lecture/course capture may have different formats and dimensions, from a simple recording of the lecture, to elaborate interactive use of hardware and software. Thursday, October 6, 2016, 3:00PM in MC 205. We welcome your materials, suggestions and questions! MC 205 is the Professional Development Room on the second floor of the Miller Center (http://www.stcloudstate.edu/campusmap/default.aspx). To find MC 205, please use this virtual tour. 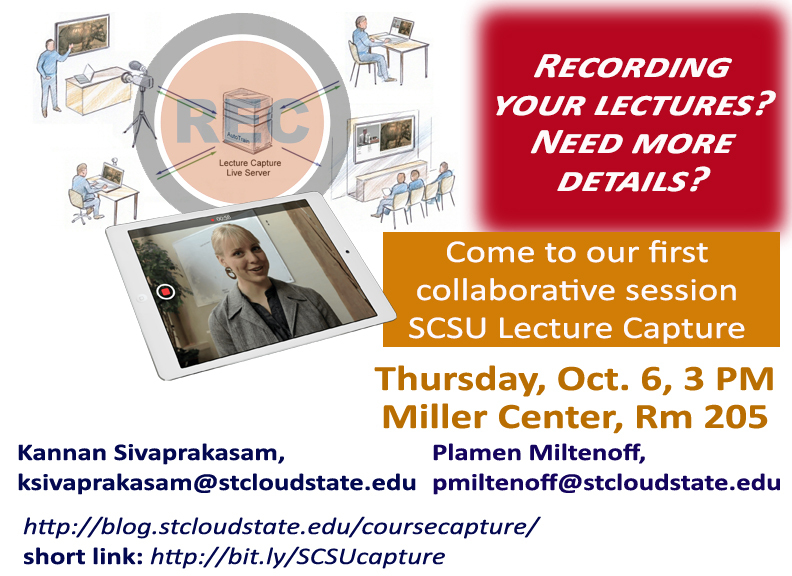 Open in Google Chrome browser the following link: http://web.stcloudstate.edu/pmiltenoff/vr_library/virtual_guide.mov. File will download and you can open it in QuickTime application. If you need assistance to find us, please let us know. Echo360 lecture capture appliances and some Sonic Foundry Mediasite appliances. While lecture capture appliances are “not cheap,” according to Lucas, they reduce the complexity for faculty and staff. Sonic Foundry Mediasite appliances with CollegeNET 25Live scheduling software to automate the lecture capture process. installing lecture capture appliances and high-definition cameras in the large lecture halls at UMass Lowell has helped reduce DFWs (drop, fail, withdrawal rate) in high-enrollment classes such as Calculus 1.